Congratulations on your upcoming wedding! As a professional harpist, I enjoy working with couples to enhance their day with live harp music. 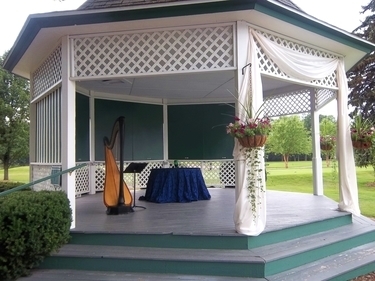 I am happy to play for outdoor weddings, simply requiring a flat, dry, and shaded area in which to set up the harp, with a back-up plan for inclement weather. Reception and rehearsal dinner music (cocktails, dinner, etc.) 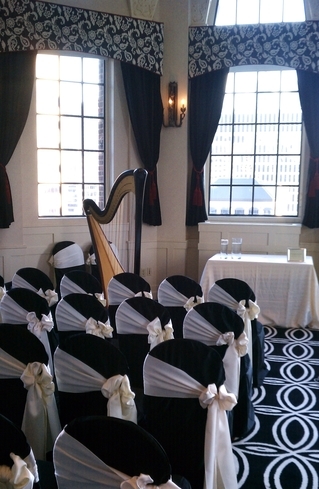 is available for a discounted rate when you also book harp music for your wedding ceremony. Please contact me for a quote and to discuss how harp music fits your vision for your wedding! You may also be interested in having me create a custom harp recording of your wedding music! Contact me today for a quote or for more information, or review my list of most popular wedding music! This service format is also offered for commitment ceremonies, civil unions, first communions, christenings, and baptisms.